Adventure Bay Amusement Park combines relaxation and fun in one amazing complex. The whole family is going to love it here. 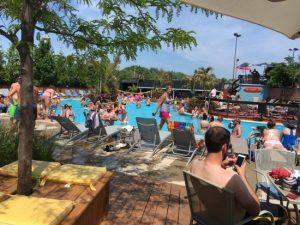 With a large arcade, go-kart track, and the biggest pool this side of Lake Erie, Adventure Bay is the height of vacationing. Adventure Bay is just a hop, skip and a jump from downtown Put-in-Bay on Main Street. The Put-in-Bay Post Office and Island Hardware are close by. The tropical vibe hits you as soon as you set foot on the property. The pool greets you, sprawling out over 9000 square feet of pure relaxation. The pool deck is decorated in a tropical theme with real palm trees gently swaying in the breeze. Dive in and play around in the water or really do it up with reserved seating. Set up camp on the pool deck or live it up in one of the cabanas. Reserved guests enjoy the benefits of their own server, bottle service, and plenty of places to lounge. Besides fruity cocktails and beer, Adventure Bay has a full menu. Choose from pizzas, paninis, and salads. They update their menu every summer. For a change of pace head into the arcade. Challenge your friends to air hockey, Golden Tee Golf, and other classic games. Win tickets and turn them in for awesome prizes. The go-kart track is fully modernized. The carts are all electric so that annoying buzzy sound is gone. Another great way to get your competition on. Head back to pool afterwards and relax with a drink. It’s easy to spend the whole day at Adventure Bay. When it’s time to finally change out your swimsuit head into downtown Put-in-Bay, choose from friendly neighborhood bars like Frosty. Listen to live music at the iconic Round House Bar. There is always the romantic Red Moon speakeasy or the amazing lake views at the Boardwalk.